John Allan, the consultant archaeologist of Exeter Cathedral, gave the second talk on “The Building of Exeter Cathedral”. The first part of the talk had been given in September 2017, and had described the early start of the building, beginning at the Eastern end, and progressing as far as the two Norman Towers. Today he began with the start of the Nave, when the cathedral was in the charge of Bishop Stapledon, (1307 – 26) who with his considerable wealth was able to make progress. He was, however, murdered by a London mob when he was pursuing some debtors and was then buried in the choir. The eastern part was built with local limestone but was then changed to stone from the quarries at Beer, which is whiter. The next bishop was Bishop John Grandisson (1327 – 69), who was a great lover of books and the arts. There are a number of manuscripts surviving from this time to which the Bishop had added his strong opinions. One of these documents ended up in the Bodleian Library in Oxford. Developments were being made in the pattern of the vaulting in 1340’s. There are other examples in Bristol, and Ottery St Mary. Purbeck marble was used for the pillars in the nave, which led to a dispute about payment. Two large wooded bosses in the nave, one depicting the murder of St Thomas a Beckett, the other a King, can best be seen with binoculars. New designs were also incorporated into the windows, and the nave was completed in 1342. 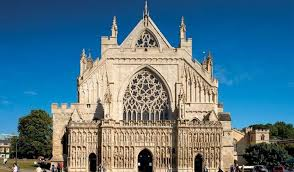 Exeter is famous for the West screen with its statues. One of St Peter, to whom the cathedral is dedicated, had pieces removed, as it was believed to have healing powers for sore legs. Other damage occurred when bonfire parties were held nearby. The screen was raised in the 15th century, it had the twelve apostles, with Mary the Virgin, but she was removed and replaced by Richard II, and whether he should remain has caused a contemporary debate. John Allan finished by saying he hoped many of us would visit the cathedral again and advised us always to “Look up and take binoculars”. In answer to a question about casualties when building, he said the only recorded one was a small boy who was killed by falling mortar. The skilled stone masons had come from all over the South of England.